Copyright in this site, all editorial content, all articles, graphics, and publications within are owned by Wayne Black and Associates and protected by U.S. copyright and international treaties; all rights are reserved. Wayne Black and Associates owns the logo and the "look" and "feel" of the web site including the color combinations, button shapes, layout, and all other graphical elements. 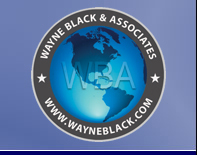 Wayne Black and Associates does not collect any personally identifiable information about you other than information that you affirmatively choose to submit to us, such as your e-mail address and name when you subscribe to one or more of our e-mail-based newsletters. Wayne Black and Associates also automatically collects aggregate information about the use of our site, including which pages are most frequently visited, how many visitors we receive daily, and how long visitors stay on each page.